The first three months of 2013 have passed in a blur. I've been handling a very busy caseload at work (up to 78 students as of last Friday) and that means I've had to bring a lot of work home. Throw in doing the taxes, a commitment at church and lots of travel and you can see that there has been no time for the sewing machine. The last time the machine saw any action was when I took a class on sewing zippers at the end of February. So it was high time that I got back into sewing. My quilt guild had a workshop on Friday night that I had signed up for before my life got so busy, and although I thought about skipping it, I managed to choose fabrics, load the machine into my car and go. I'm so glad I did as it felt good to be piecing again. The class used Bonnie Hunter's Pineapple Blossom pattern which looks challenging but is super-simple to put together. 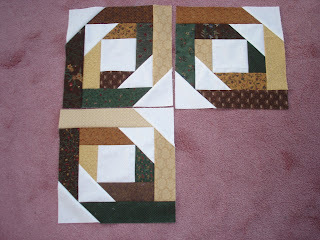 Go check it out at www.quiltville.com (scroll down on the right hand side for the free pattern).